In many homes, the kitchen is the most used room of the home and an area that is frequently seen by family members and friends that are invited to visit. For this reason, many people are concerned about their kitchen areas looking stylish and well put together in terms of décor and color scheme. A laminate kitchen countertop can go a long way towards making the appearance of the kitchen area fit with the homeowner's idea of style and class. 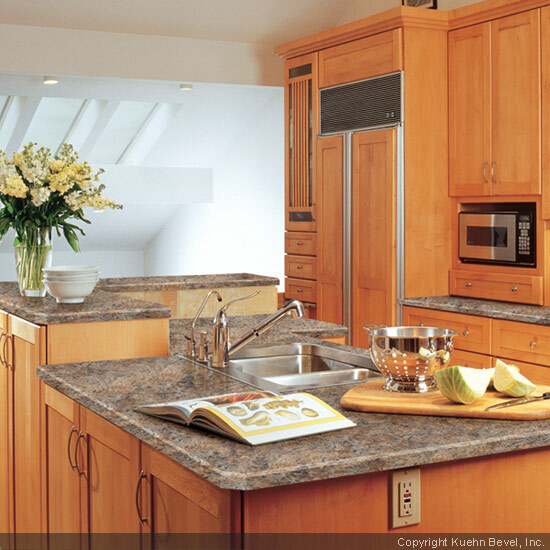 Laminate kitchen countertops are available in a wide variety of colors, patterns, and styles to appeal to a wide range of homeowners across the nation. Some of the countertops are cast in solid colors that can be bold and bright or light and pale to coordinate with the homeowner's existing décor. Other laminate countertops can be found in patterns with small and subtle prints, bold lines and designs, or even resembling another type of countertop, such as marble, granite, or tile. The numerous designs and colors available make it much easier for the homeowner to find a laminate countertop that fits with their décor needs. To make the laminate countertop the focal point of the kitchen area, it is important to highlight the dominant properties of the countertop. As most cabinet sets are set at waist level, it is important to draw attention to the countertop through means other than the height of the countertop. There are numerous ways to accomplish this and the most effective way will depend on the existing décor in the kitchen area or how you would like the room to look once the installation is complete. One of the easiest ways to make the laminate countertop the focal point of the kitchen area is to use the colors available for laminate countertops to create a dramatic contrast between the countertop and the rest of the kitchen. Some people that have light colored cabinets and walls will choose a countertop color that is very dark so it will be very visible and noticeable when a person enters the room. From a distance, the countertop will look like a bold line slicing through the middle of the kitchen, but up close, the countertop will draw the eye and capture attention. Another way to make the laminate countertop the focus of the kitchen is to use plain, flat colors for the walls and cabinets of the kitchen and a textured color or bold pattern for the design of the countertop. The countertop will provide a nice complement to the plain colors of the walls and will allow the person to focus on the décor items that have been placed on the top of the countertop for an attractive look for the kitchen area. The kitchen countertop is one of the largest items in the entire kitchen area, so making it the focal point of the kitchen will not be difficult at all.